Qualtrics (XM) intends to raise $400 million from an IPO of its Class B stock, per an amended S-1/A regulatory filing. The company provides enterprises with a software service that enables them to collect data from employees, partners, and customers. 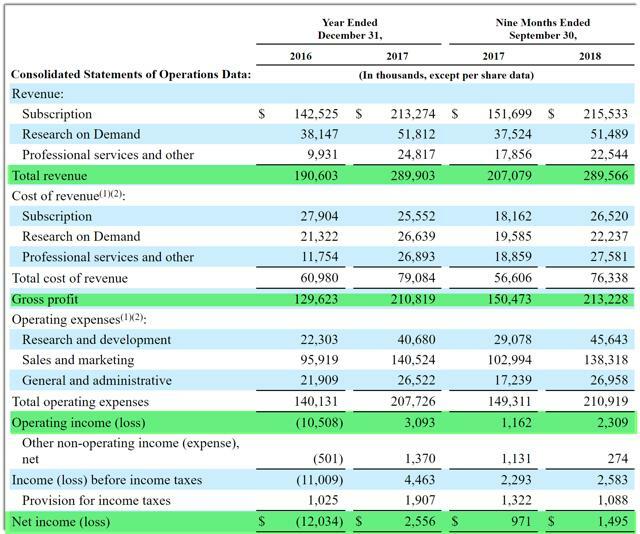 XM is growing quickly, is profitable, has positive free cash flow, and the IPO valuation appears reasonable. I’ll be looking for a reasonable entry point in the likely heated market action post-IPO. Provo, Utah and Seattle, Washington-based Qualtrics was founded in 2002 to provide software as a service that empowers organizations with the data they need to keep their customers satisfied through various stages of the customer journey. Management is headed by Co-Founder, Director and CEO Ryan Smith, who previously served in Brand Management at Ford Motor Company. Gather and analyze a new class of data it calls Experience-Data, or X-Data, that is richer, more immediate, and potentially noteworthy to understanding the quality of experience than traditional operational data. Ensure a quality experience holistically, unifying information and insights from customers, employees, and partners and recognizing the operational linkages between these stakeholders. Become more predictive and proactive, closing feedback loops, and turning insight into real-time action to prevent and close experience insufficiencies where necessary. Decentralize the analysis and decision-making process across the organization by delivering capabilities in a simple, easy-to-use solution. The firm’s focus industries, throughout which the company’s solutions are utilized include, but are not limited to, B2B, automotive, government, travel & hospitality, financial services, media, airlines, and retail industries. Investors in Qualtrics include Grandview Holdings, Accel, Sequoia Capital, and Insight Venture Partners. The firm plans to invest further in its direct sales, indirect sales, and marketing processes with a focus on enterprise customer growth. The company has developed more outbound sales capability to drive a ‘land and expand’ sales approach since its system can be used by individual teams. Management also plans to expand its international presence via its hub-and-spoke model of centralized inside sales teams combined with regional direct sales groups. Qualtrics states that as of September 30, 2018, it had a net retention rate of 122%. Any NRR above 100% is very good, and the figure indicates that the firm succeeds in generating more revenue over time from each customer in the cohort on average. According to a 2018 market research report by Research and Markets, the global customer experience management market is projected to grow to $21.3 billion by 2024, representing a very strong CAGR of 22% during the period between 2018 and 2024. The main factor driving market growth is the increasing need for personalized customer experience. XM intends to sell 20.5 million shares of Class B stock at a midpoint price of $19.50 per share for gross proceeds of approximately $400 million, not including the sale of customary underwriter options. Class B shareholders will be entitled to one vote per share. Class A-1 and A-2 shareholders, which are the founders and other existing entities, will be entitled to ten votes per share and other voting control mechanisms. Multiple share classes are a way for founders and existing shareholders to retain voting control of the company even after losing economic control. The S&P 500 Index no longer admits companies with multiple share classes into its index. Assuming a successful IPO at the midpoint of the proposed price range, the company’s enterprise value at IPO would approximate $4.1 billion. Excluding effects of underwriter options and private placement shares or restricted stock, if any, the float to outstanding shares ratio will be approximately 9.5%. This is a relatively low float IPO. We intend to use the net proceeds from this offering to satisfy tax withholding and remittance obligations of up to $ 57.4 million (as of November 15, 2018) related to the settlement of certain outstanding RSUs in connection with the effectiveness of this offering… We also intend to use some of the net proceeds to satisfy tax withholding obligations related to the vesting and settlement of RSUs, which will begin to vest after the completion of this offering…We also intend to use the net proceeds from this offering for working capital or other general corporate purposes, including funding our growth strategies discussed in this prospectus. Listed underwriters of the IPO are Morgan Stanley, Goldman Sachs, Barclays, RBC Capital Markets, Jefferies, Deutsche Bank Securities, BMO Capital Markets, Keybanc Capital Markets, Raymond James, Canaccord Genuity, Baird, and BTG. 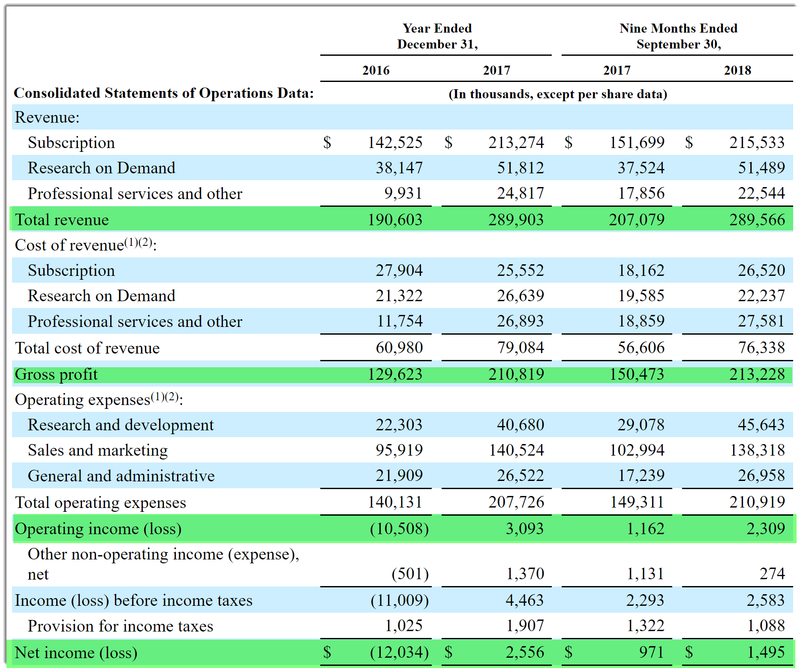 With new data for Q3 included in XM’s most recent filing, we have all the confirmation we need that the firm is growing at a tremendous rate, retaining strong profitability for various metrics, and generating significant free cash flow. The challenge for interested investors will be to find a reasonable entry point post-IPO, since there will be little if any allocation available. Institutions will likely speak for the entire deal on offer. I view Elastic’s (ESTC) recent IPO and post-IPO action as instructive. With the recent overall stock market volatility increasing markedly, ESTC dropped from $70 to $60 on two occasions, providing brave investors with lower entry points. With Qualtrics, I expect a strong first-day ‘pop’; watchful and disciplined investors may have an opportunity to acquire shares at a more reasonable price by following the stock for days or weeks after the IPO. Ill be looking for such an opportunity, as I view Qualtrics a strong competitor with significant growth prospects in its near-term future. Expected IPO Pricing Date: November 14, 2018. Members of IPO Edge get the latest IPO research, news, market trends and industry analysis. Get started with a free trial. Additional disclosure: I may purchase a small number of shares on the open market in post-IPO trading during the week starting Nov 12, 2018.